"The Big Store on the Corner." M.H. Snorf, of "The Big Store on the Corner," is in Chicago this week buying goods. It seems from the amount of business this popular house is doing that they will soon have to keep a buyer in the market all the time in order to keep the various departments of this big store full of the goods the people want. The firm assures us that no dry goods house in the town ever had such a large trade as this store is enjoying this spring and it is all because they have the goods, the prices and the treatment that suits the public. With all these popular features and the finest line of goods ever brought to the city there is no reason why they should not enjoy the confidence of the public and boast of a large trade. If you don't believe it call and see for yourself. Big Line of Rugs, Carpets, Curtains, etc. Helm, Snorf & Co. Sell to William H. Turner of Kokomo. 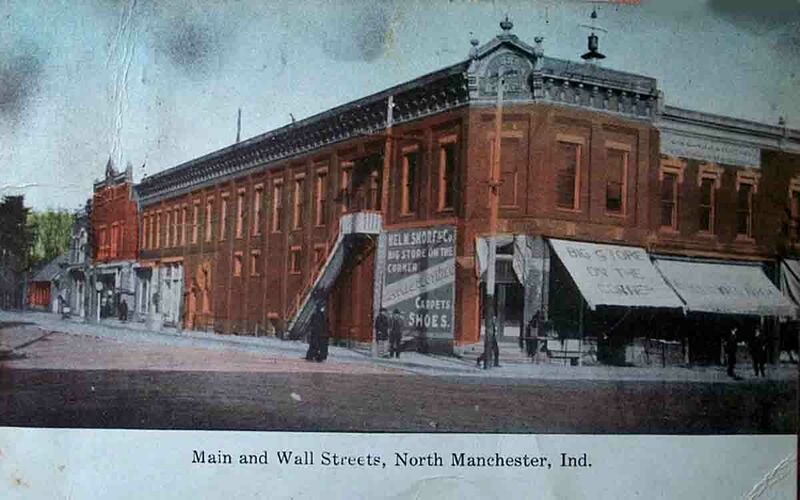 An important change was made in the business circles of the town Monday evening when arrangements were concluded for the sale of the Helm, Snorf & Co. store to William H. Turner, of Kokomo. The deal had been under consideration for several weeks, but the final arrangements were not concluded until Monday evening. Tuesday Mr. Turner arrived here, and the work of invoicing was commenced, the store being closed for a few days for this work to be done. Mr. Turner is the owner of a large store in Kokomo, and will not move here himself for the present at least, but will conduct the store with the aid of a manager. Who that manager is to be has not been announced, but it is probable that it will be a brother of Mr. Turner. The Helm, Snorf & Co. interests have been associated in the business conditions of North Manchester for twenty-six years. At that time they came here and opened a store, the firm being Helm, Snorf & Watson. Later they bought the Watson interest, and did business under the name of Helm & Snorf. Then the store was sold to Gochenour & McDonald, and both Mr. Helm and Mr. Snorf moved to Marion, where they spend a year. Returning to this city they entered the Lawrence store, the firm being known as Lawrence, Snorf & Co. This lasted until about twelve years ago when the partnership was dissolved, and they went to their present quarters, starting the store under the name of Helm, Snorf & Co. They have always had a good business, and the store has been one of the permanent and praiseworthy enterprises of the town. About six years ago death called Mr. Snorf, and since that time his son, C.H. Snorf, has looked after his interests in the store. Last spring he became interested in the Stephenson-Snorf company at Goshen, and being desirous of locating there it became necessary that a change be made. The sale of Monday was the result. B.A. Helm, the senior member of the firm, has not decided what he will do. At first he will probably take a well earned vacation, but he says that he has no business plans for the future. He does not expect to leave North Manchester, North Manchester regrets to see the Helm and Snorf interests retire from business here, but at the same time welcomes the new man, and wishes him well.